Sydney gallery-guides.com - Sydney, Australia art galleries guide Sydney Museum of Contemporary Art (MCA) information, exhibits, paintings, sculptures, address and location of Sydney Museum of Contemporary Art (MCA), George Street, Circular Quay West, tel / telephone number, moving images, installation art work, gift shop, cafe, open hours, admission charges, and general information about Sydney Museum of Contemporary Art (MCA) in Sydney area, New South Wales NSW, Australia - Last updated 30/10/2012. 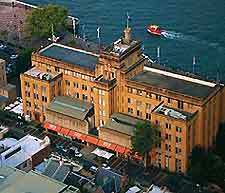 Located in a stunning Art Deco building at the front of the Circular Quay West, the Museum of Contemporary Art (MCA), features an impressive collection of modern art from Sydney and throughout the world. Sydney's Museum of Contemporary Art (MCA), in the Central Business District (CBD) of Sydney, offers a wealth of exceptional exhibitions including paintings, sculptures, moving images and installation art work. Additional features at Sydney's Museum of Contemporary Art (MCA) include a gift shop, delightful café, regular lectures and seasonal events. Museum of Contemporary Art (MCA) is easily accessible and within easy reach of central Sydney by either bus, train or ferry.